Details about SPIRITED HORSES #1 Storm THE ALARM CANVAS Art Print ~ SEPIA - Size 11" x 8 1/2"
SPIRITED HORSES #1 Storm THE ALARM CANVAS Art Print ~ SEPIA - Size 11" x 8 1/2"
Edition Size: 11" x 8.5" Size Type/ Largest Dimension: Regular Size: 11" x 8 1/2"
Spirited Horses #1. The scene shows stormy, dark clouds surrounding the horses as they seem to be in a state of fear and near panic. UNFORGETTABLE "SEPIA" ANTIQUE IMAGE! 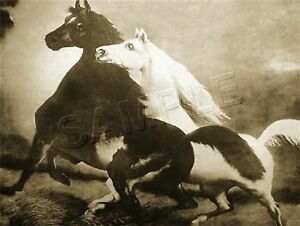 This SEPIA version, especially beautiful and unique would surely grace any wall it is displayed upon.